The fuel injector cleaner is chemical compound designed to be periodically added to the fuel of your car in order to clean the fuel injectors (in modern fuel injected engines) and allows the engine to work better. During the use of the engine (gasoline and diesel) fuel which runs trough causes a formation of carbon deposits inside an engine and fuel injectors. This can cause loss of power, poor fuel economy and eventually in some cases, the breakdown of the engine itself. That is why the fuel injector cleaner should be a part of regular car maintenance and something you should add to your tank every once a while just to get most of your car and best fuel economy. Here you will find everything you should know about and tips to find the best fuel injector cleaner for you. 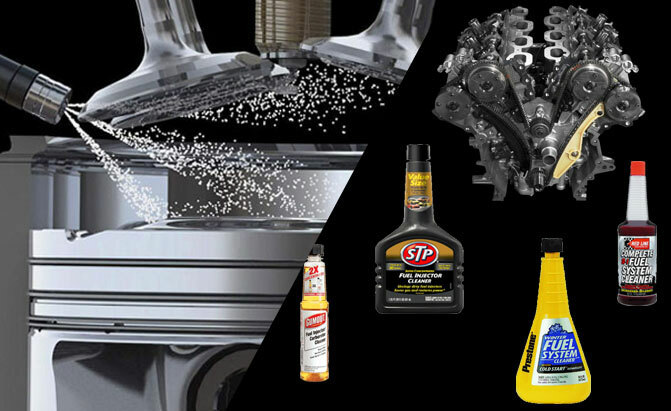 Let’s read the fuel injector cleaner reviews and find out the right product meets your needs! VOLUME : 11 FL oz. For use in diesel engines and heavy machinery, Lucas introduced 10013 Fuel Treatment product. It comes in the 1-gallon package (4 liters) and has two features. 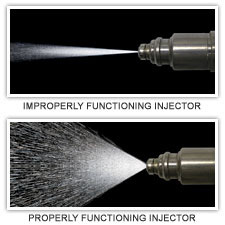 One is regular fuel injector cleaning and the other is the fuel conditioner feature. This means that you can not only clean your fuel system but make your diesel fuel more stable for a longer period of time. It is very helpful for heavy trucks and machines which sometimes operate under extreme weather conditions and low temperatures which are known to affect the diesel fuel. Also, it helps stabilizes the fuel after a long period of no use. This is why this product comes in the big package and it is clearly intended for professional users and diesel truck owners. 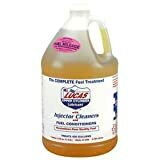 Some sources say that this fuel injector cleaner fluid will work with gasoline engines but we don’t recommend it and if you have gasoline powered vehicle use correct product for it. 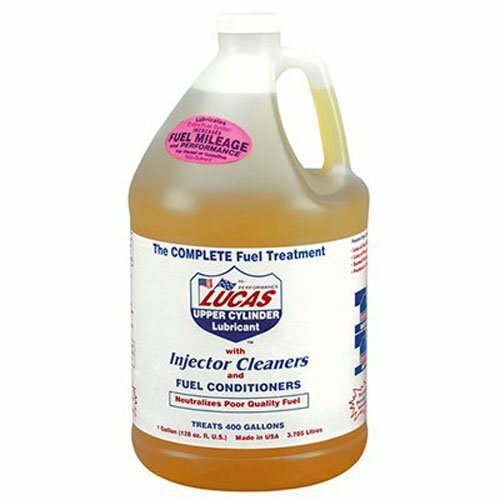 At the affordable price, you will get a 1 gallon of fuel treatment fluid which makes Lucas 10013 one of the best deals on the market if you are looking for a dependable product for your diesel engine or machine. BG 44K cleaner fluid is one of the most popular products on the market and even though the manufacturer is not as popular as Royal Purple or Liqui Moly or STP, the BG 44K is still the common choice for most users and it is recommended by some of the car manufacturers which is good to know. This fuel injector cleaner fluid is aimed towards gasoline engines with various specifications, from low-performance everyday cars to high-performance sports machines. The manufacturer suggests that this fluid cleans every part of the fuel system, the tank, fuel lines, injectors and even a combustion chambers so this is very powerful and aggressive formula. However, this means that fluid can affect catalytic converters or fuel sensors and you should consult a mechanic before you use it. Since the chemical formula is so strong it is also recommended for use in older carburated engines for cleaning the fuel lines and heads of the engine. 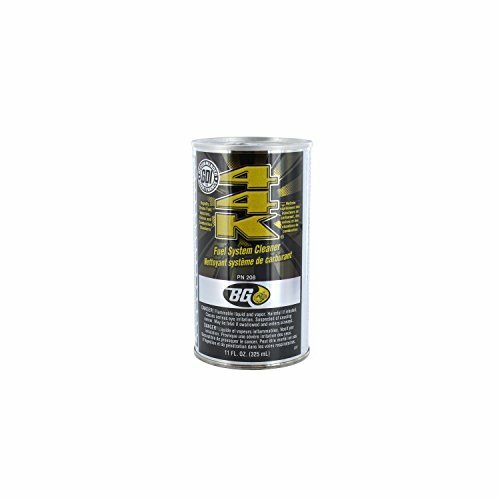 With affordable price BG 44K Fuel System Cleaner is a good proposition for every enthusiast and it comes in small (11 OZ – 325 ml) tin package for safe transporting and keeping. The Royal Purple fuel system cleaning liquid is a universal product for both gasoline and diesel engines and for use in cars and motorcycles as well in the marine (boat) engines. The manufacturer guarantees improvements in fuel economy and increases in power and decrease of hydrocarbon, NOx and CO emissions which is important. We are confident that fuel economy is improved as well as exhaust emissions but we are also a little skeptical about the increase of power since fuel injector cleaner fluid is not power add-on for cars and power will be the same as car manufacturer specified when new. That is why you should expect a better running and more responsive engine but not a more powerful one. However, the selling points of this product are its price and the fact that you can use it on practically any internal combustion engine, 2 or 4 strokes, gasoline or diesel. Also, the manufacturer recommends regular use for best results and the product is available in two sizes (6 OZ and 20 OZ). Also, you can find a better deal when you buy a package of various car care product from Royal Purple including this fuel injector cleaning fluid. The small but effective Red Line SI-1 fuel system cleaner is known for its chemical formula with a lot of polyether amines (PEA). In theory, the more PEA the formula has the better it is but it is not always the case in real situations. 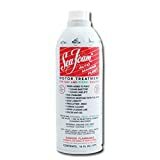 No doubt that Red Line SI-1 is a powerful cleaning fluid but it is also very aggressive so it can affect other components of the car while cleaning the fuel system. The customers reported that it affects the fuel sensors on some models causing the fuel gauge to stop working. Also, the Red Line SI-1 is a more expensive than the similar product from other manufacturers and since it has a bigger percentage of PEA it is easy to see why. However, if you need a fast and strong fuel system cleaning fluid, you are good with SI-1 but for more gentle engines and machines, you should use other products. This fuel system cleaner fluid is not recommended for diesel engines or LPG conversion of gasoline powered cars. It is available in 15 OZ package and it contains synthetic upper cylinder lubricant chemicals which are good for engine head treatment. 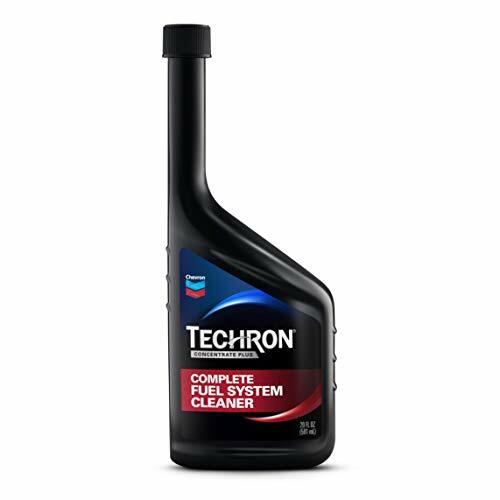 Users speak highly of Techron fuel system cleaner fluids and 65740 is one of more popular choices on the market. The affordable price and nicely sized package of 20 OZ give you a lot for your money. Besides the regular features like cleaning of all fuel lines, improving exhaust emissions and fuel economy the Chevron 65470 offers also a cleaning of your fuel sensors. Sometimes, in old or hard used vehicles, fuel sensors stop working and fuel gauge on your dash is stuck. Often the problem is in dirt which clogs the sensor in the fuel tank. This product can help you if this is the problem and users reported that their fuel sensors started working again after treatment with Chevron 65470 product. 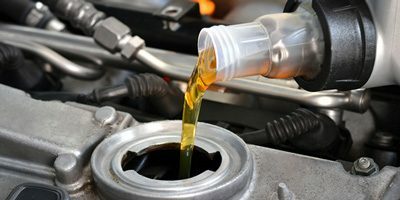 The manufacturer suggests that it should be used with every oil change for best results and this means that product is not over aggressive (fewer polyether amines (PEA)) and will not affect other components of the engine. However, this fuel injector cleaner fluid is for mainly gasoline engines and is not recommended for diesel or LPG converted petrol engines. The Sea Foam SF-16 is a little bit different product on the market and its chemical formula consists 100% petroleum and not common polyether amines (PEA) as other products on the market. This means that SF-16 is not only for cleaning the fuel system and injectors but for cleaning all other parts of the engines from dirt and grease. 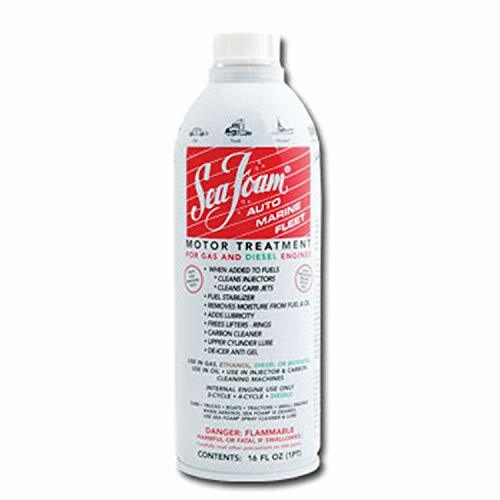 Since it is petroleum based it is safe for use on carbureted engines and stuck cylinders. This product can be used as the fuel additive and as oil additive for cleaning internals of the engine from grease and dirt. However, if you chose to use it as an oil additive it should be added to oil before the oil change, not after. It proved to be very effective at losing the sticky valves and cleaning the engine from the dirt in the oil. The very affordable price and 16 OZ package make SF-16 interesting for anybody which wants “two in one“ product and something that could clean all of the engine. Since it is petroleum based it is best for classic car owners and for older carburated engines or engines that sat for a very long time. 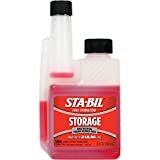 The important thing to know about this product is that STA-BILL 22208 is not a fuel injector cleaning fluid but a fuel stabilizer which is a totally different thing. However, this fluid has some cleaning abilities but cleaning isn’t its main feature. The 22208 was designed to stabilize the fuel in fuel tanks of the car or machines which sit for long periods of time and manufacturers guarantees 24 months protection with the use of this product. If you let your fuel sit in the tank for over a month it becomes chemically unstable and can cause problems when the engine is used. STA BILL 22208 keep the gasoline fresh for two years and ensures you that this old fuel will not harm your engine or its components. Also, after the use of STA BILL 22208 you don’t have to drain your tank and put fresh fuel and you can use the old one with no problems. It comes in various packages ranging from as little as 4 OZ to pack of four big bottles (128 OZ) and it is easy to use. It is not recommended for use in diesel or LPG powered engines, only gasoline ones. The Liqui Moly 2007 is average fuel injector cleaning liquid which comes in compact size package and affordable price. Despite the small amount of fluid (300 ml) this product have the same features as other (clean fuel injectors, fuel lines and combustion chambers of the engine) and it aimed to gasoline-powered engines only. However, the manufacturer claims it is safe for engines with catalytic converters which mean that is good for newer models and its chemical formula is less aggressive than others. 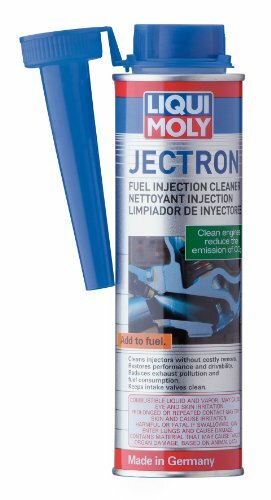 So if you got a Geman made a vehicle, you should consider Liqui Moly 2007 Jectron Gasoline Fuel Injection Cleaner. Users reported various other improvements in engine work such as lower engine temperature, smoother idling, and significantly better fuel economy. It comes in only one size and users reported that half of the can is enough for an average size fuel tank. 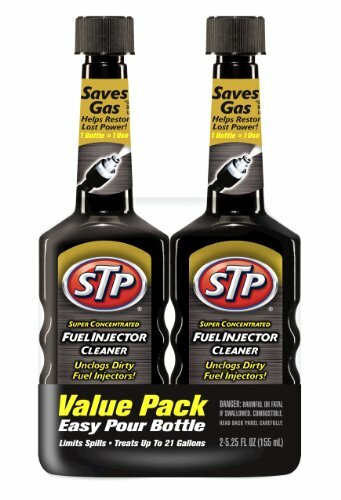 STP’s fuel injector cleaner fluid comes in interesting double pack at very affordable price. It helps restore power and acceleration of your engine by cleaning all fuel lines and helps your fuel efficiency. It is safe for all gasoline engines, however, it is not recommended for diesel engines. Its chemical formula contains concentrated detergents that help dissolve and remove harmful carbon, gum and varnish deposits on fuel injectors which basically wash your fuel system clean. Users reported that it is compatible with newer engines and catalytic converters since its formula is not so aggressive and has fewer polyether amines (PEA). You only need one bottle of STP 78577 to get wanted results and since it is detergent based it should not affect your fuel sensors or other systems. Buying a double pack (two bottles) is the best value since but manufacturer offers different packages and even 12 bottle deal. Compared to the other products on the market it is safe to say that STP 78577 is as good if not the better since it is less aggressive on engine components. The Star Tron product is interesting offering on the market since combines fuel injector cleaning with fuel stabilizer feature and is aimed specifically at modern ethanol gasoline burning engines. It uses special enzyme technology that allows all engines to start easily and run smoothly, even after sitting idle for months. The secret is in breaking down excess water and sludge in the engine to sub-micron size, allowing it to be safely burned away during normal engine operation. Since its chemical formula is not aggressive it is safe to use in gasoline and diesel powered engines. Besides that, if used as a fuel stabilizer, Star Tron will stabilize fuel for up to two years, preventing the formation of gums and other solids that clog fuel injectors. This product comes in a small pack of just 1 OZ but the manufacturer claims it is enough for 8 gallons of fuel. However, this product is somewhat more expensive than the rest but since it combines more than one feature it can be considered a good buy. Users reported that Star Tron Enzyme Fuel Treatment is effective and it delivers what it is promised. Since the mid 80’s when fuel injected engines become a standard of the automobile industry, manufacturers noticed that over the years of use, intake systems were affected by dirt, small particles, and carbon deposits. The main problem is that that kind of deposits inside of the injector stops the fuel running smoothly and makes the diameter of the injector nozzle smaller so engine’s fuel delivery is far from ideal. All of that causes engines to be a lot noisier while working, harder to start and use more fuel. The situation is worse in diesel-powered cars and truck since the construction of the injector in these types of engines is more complicated and diesel injectors work with higher pressure than gasoline ones. When fuel injectors in diesel engines clog up, fuel is not properly sprayed into the cylinder head causing bad combustion cycle and eventually kills the engine. At this moment, the fuel which is available at the gas stations all over the world is less stable than before since the oil companies started using ethanol as an octane-boosting ingredient. 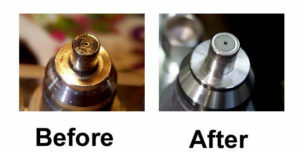 This means that modern engines using modern fuel are in need of injector cleaning on regular basis. 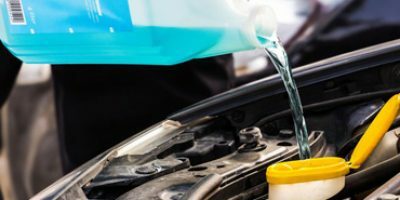 So, a lot of car care products manufacturers started developing chemicals which clean the injectors simply by adding it to the fuel tank and while driving your car, the mixture of fuel and cleaning chemicals should clean your injectors. However, sometimes the fluid itself is not the answer for dirty injectors and that is when the build-up of particles in injectors is so big that ordinary chemical cleaning is just not effective. It is very important to buy a proper fuel injector cleaner fluid which is best suited for your car. Of course, the diesel fuel injector cleaner is not going to work well on the petrol engines and vice versa. In fact, you should avoid that kind of mistake since it can cause a lot of problems. During the last few years, LPG conversions of petrol engines are common in some countries and even that LPG powered engines have far fewer problems with clogged fuel injectors, they still need some periodical cleaning. 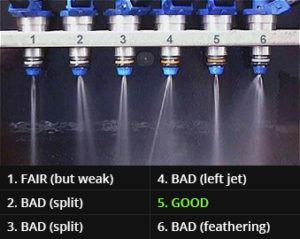 So, buy a fuel injector cleaner according to fuel type, specifications, and usage of your engine. Note that high-performance engines are more sensitive to the dirty injectors than regular performance units. So if you have a sports car, you have to pay more attention. Fuel injector cleaning fluids come in all shapes and sizes and you can buy a small bottle or a gallon of it. But if you don’t need an industrial size package you should buy an amount which is enough for your personal use or one cleaning procedure. 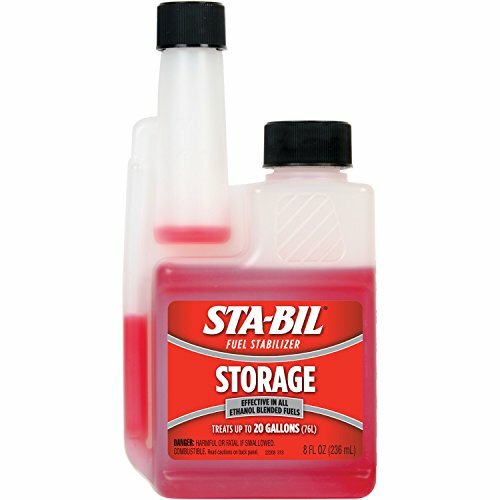 If you buy a larger amount, put it in safe storage since cleaning fluid is flammable and should be out of reach of children for safety reasons. Since not every fuel injector cleaner fluid is not compatible with every engine you always should look for manufacturers suggestions. This way you will avoid any potential mistake and get the best results. Some companies work with car manufacturers in order to deliver the best product for the specific type of engine or car. That is why is the best to do a little research before you buy fuel injector cleaning fluid and use it. All modern engines have catalytic converters as an integral part of the exhaust system of the car. However, those converters are designed to work with fuel fumes and the mix of fuel and cleaning fluid can do some damage and cause “engine check“ light on your dashboard. In most cases, it wouldn’t do any harm to the converters but if you use wrong or too aggressive fluid it can “burn“ the catalytic converter. It is very important to put the right amount of fluid in your tank not just to get the best results but to avoid the potential problems. Smaller amounts are often not enough to give you any substantial improvements and larger amounts can cause very serious malfunctioning of the engine. Most of the fuel injector cleaning fluids on the market come with clear instructions on how much is the right amount for displacement of your fuel tank. For best results, always add the fluid to the full tank of fuel. You can calculate the amount of cleaning fluid to suit the half of the tank but for best results and a piece of mind, use the full tank. One of the most common mistakes is not using your vehicle after you added the fuel injection cleaner fluid. It is essential to drive your car right after you put the fluid in and use the whole fuel tank as soon as possible. For best results, use your car on long drives, if possible on the highway. This way the fuel mixed with cleaner fluid will have a steady flow through your engine and clean injectors better. Avoid driving in the city because then the pressure and the flow in injectors varies and not clean intake system as it should. By any means, do not leave your car to sit after you added the fluid to the fuel. The fuel injector cleaner fluid is an aggressive chemical mixture which could be very bad for your fuel or intake system if left to sit for too long. Chemicals could affect the rubber parts, hoses and sealing units in the intake system and cause big problems with leaking fuel or air from the engine. So it is essential to use the car and use the whole tank. During the cleaning, procedure use only one product from one manufacturer and do not mix products. If you are short on fuel injection cleaner fluid it is best to buy a new bottle of the same fluid and avoid mixing it with a different type of product. The reason is simple since the different brands use the different chemical formulas and mixing two products can cause various problems. It is safe to say that your car will not get a proper treatment if you mix product and can cause serious problems with the running of the engine or with the intake system. There is no definitive or an obligatory moment when should the car get a fuel injection cleaning treatment neither the manufacturers propose such terms but using your vehicle and paying attention to the shape of your engine, you can easily decide when it is the time. However, if your car is a few years old and has decent mileage it is time to get its first fuel injection cleaning fluid treatment. 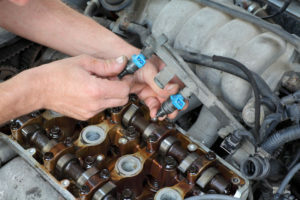 First signs of dirty injectors are a slight loss of power, hard starts, and loud engine noises. In some vehicles, mostly diesel-powered cars and trucks, the color of exhaust smoke could be the sign that your engine is in need of fuel injector cleaning. In some countries, where the smog check is obligatory, bad results on the test could be the signs of clogged-up injectors. It is advised to make fuel injection cleaning part of routine maintenance since especially if you use your car much and have high mileage. City driving can really affect the fuel injectors so if you use your car mostly in stop light traffic do it at least once a year for best results. In areas where diesel vehicles are common and quality of the fuel varies, using the fuel injectors fluid should be used with every service intervals and changing of the fuel, oil, and air filters. Since today’s fuel is less chemically stable than before due to increased use of ethanol it is prone to changing its characteristic inside your tank if left to stay for long. After about month and a half inside the gas tank fuel is not so safe for use in modern cars. So, if you have a vehicle that stayed for long period of time or over the winter or in some extreme conditions it is best to drain the old fuel and put some new one with the addition of fuel injectors cleaning fluid. This way you will clean your tank of old fuel and clean whole fuel your system also. What you put inside your body in terms of food and liquids is vastly similar to what you put inside your car. The benefits of quality materials are countless and this is why we will highlight the advantages of fuel injector cleaners in particular. Now it is important to note that some of those magic bottles will focus more on maintenance and keeping your car running smoothly. Others will enhance the performance of your engine and will likely boost your speed and acceleration. Lubrication – similar to motor oil, car fuel injector cleaners also have a lubrication role. Once the substance makes its way inside the engine it will have a positive effect on most parts there – the rings of the intake valves, pumps etc. This way you will notice less carbon build-up. Furthermore, the friction between the engine’s parts will be significantly reduced. Cleaning – carbon deposits are one of the largest threats to an engine in the long run. Since you cannot access the insides of your engine on a daily basis, you can keep it clean by using top-notch substances. In our case, you can rest assured that the combustion chamber and the nozzles of your system will be clean and well-maintained. Efficiency – thanks to the fuel injector cleaner you will burn less fuel and will get a better consumption. Not to mention that your car should also work smoother. Your car will start easier when it’s cold – it’s exceptionally frustrating to not be able to start your car during winter mornings when you are late for work. Well, these problems should now be reduced. Better throttle response – over time cars lose power and pressing your gas pedal will have a reduced effect. This is going to be restored upon using a fuel injector cleaner. Less corrosion – let’s face it, you can’t completely get rid of corrosion but at least you can reduce it. Smoother ride – this basically means that your engine will stutter less. Other words that come to mind are stumbling and hesitation. All not good when it comes to the work of an engine. Harmful emissions will be reduced – this is quite the important benefit especially nowadays when authorities try to reduce the bad emissions from cars on a daily basis. The more eco-friendly of a vehicle you drive, the larger the chance you will not be fined or banned from driving it around downtown. And finally, we should mention that the likely greatest benefit of fuel injector cleaners is the improved lifespan of your engine. All in all, you should have fewer concerns with your car when you use a top class product. The short answer is typically the best one and in our case, all you need to know is that the main purpose of your fuel injector cleaner is to obviously clean the fuel injectors. That’s too many identical words so no stir up should be caused. The fuel is delivered by fuel injectors straight to the engine. This is where the combustion happens and your car either starts or simply runs faster. This goes to show you that the condition of your fuel injectors really matters in order to have a never-ending nice flow of fuel to the engine. As you might expect, those injectors collect a lot of build-up and residue. This is where the fuel injector cleaners come into play. The most important chemical to mention is polybutene amine also known as PBA. It pretty much does all the cleaning around your engine. You will enjoy cleaner ports and intake valves and not only fuel injectors. The other component which really matters is polyether amine or simple PEA. It will give you some additional advantages and will typically affect how smoothly the car runs. All of this is fine but some people are often skeptical. Since the price of these additives isn’t very high, how can we be sure that they actually work well? We can’t be sure of that and this is why we recommend not buying the cheapest stuff out there. Tests have shown that the proper concentration of these chemicals will definitely have a favorable effect on your engine. The problem comes when you opt for a simpler, cheaper product which barely contains those chemicals we listed above. Some products are also too diluted to do anything. And lastly, don’t expect these liquids to do wonders for old cars which haven’t been maintained almost at all. This isn’t Holy water – it won’t resurrect your decades-old pile of steel. What exactly will my fuel injector cleaner do? It will clean the parts of your engine and will significantly reduce build-up caused by carbon. This should bring back some engine power and should give you less stuttering and pinging. How is all of the above achieved? It is all about what’s inside the little bottle. The best products have plenty of additives which can deal with a wide specter of problems. Will friction also be reduced? Absolutely. Most products contain Upper Cylinder Lubricant also known as UCL. Its main function is to actually lubricate most of the components inside the fuel system. We are talking about the fuel pump, the upper cylinder, and the injectors, of course. Are there such cleaners for diesel fuel as well? Yes, there are. Their effect is especially good during the winter when diesel cars are known to be slow to start. Will my fuel consumption improve? It definitely will but we cannot say exactly by how much because there are all sorts of engines, drivers and weather conditions. This also depends on the quality of fuel that you put in your car. Don’t be surprised if the efficiency rate drops slightly upon the continuous use of the cleaner. It really depends on how big your engine is but typically a 6 oz bottle is good for 20 gallons of gas. Pour the entire bottle, don’t worry about it. If your car engine is in the lower class, a ¼ bottle for every 5 gallons of fuel will also do just fine. In case your engine has bigger lubrication problems, you can increase the amount of at least two times. ROYAL PURPLE FUEL SYSTEM CLEANER $$ 20 gallons 20 oz. CHEVRON TECHRON FUEL INJECTOR CLEANER $$ N/A 20 oz. As you can see, the fuel injector cleaning fluid is a very important car care product which can help your car work cleaner and better and save you a lot of money for potential repairs. That is why cleaning your fuel injectors should be a part of your car maintenance routine to get the best results and fully protect your car and your wallet. Use our guidelines and reviews of the popular product to find the best fuel injector cleaner fluid to suit your car. We hope you enjoyed the fuel injector cleaner reviews of 2019!